Documentation Fee field added. The doc fee can be taxed and capitalized or paid at drive-off. The tax on the doc fee can be capitalized or paid at drive-off. Fuel Cost Comparison Routine. This new routine computes the fuel cost for two vehicles and compares them. The annual fuel costs are computed, the annual and monthly savings, annual fuel consumption, and percentage savings. Uses both the U.S. miles-per-gallon and metric liters/100km systems. 0% Loans. Both retail and balloon loans can be calculated with a 0% interest rate, even with credit insurance. For retail loans, the last payment is adjusted, if necessary, to make the finance charge exactly $0.00. On balloon loans, the balloon payment is adjusted. See 0% Loans Frequently Asked Questions. Interest buy-down amounts can be calculated for 0% loans with the enhanced dealer-reserve routine. See Instant Upgrade and Returning Your Calculator for Service. Rebates used as cash downpayments can be excluded from Sales Tax, and the downpayment tax, if any, can be capitalized for Sign-&-Drive deals. Computes new and used vehicle leases using a money or lease factor, and using simple-interest rates. Results can be printed with the optional printer. Includes bank fees, lease-end markup, security deposit (automatically calculated or entered), luxury tax, state and local sales taxes. New Millennium Edition allows non-taxed Extended Warranties and other items to be included in tax-the-payment states. The lease price, or payment can be calculated. The drive-off cash and total amount is calculated. Computes used car leases (residual dollar amount can be entered). New Hard Adds field for dealer-installed options or used-car add/deducts. Displays a complete Regulation M disclosure. Formulas are built in for sales tax rules for all 50 states, and for over 25 leasing companies. Computes retail finance and balloon loans with credit insurance. The credit-insurance routines have been updated to handle 0% loans. Computes FRB Regulation Z A.P.R. for retail finance and balloon loans with prepaid finance charges. Computes dealer reserve by several methods. Computes interest rate buy down amounts, even for 0% loans. Computes monthly, weekly and biweekly loans -- ideal for new and used vehicles. Formulas are built in for all 50 states for Credit Insurance on retail and balloon loans, including 0% loans. Rates can be entered and changed by the user. "Ask State" option allows you to quickly jump from one state to another -- ideal for dealerships near a state line or for consultants and sales training organizations. 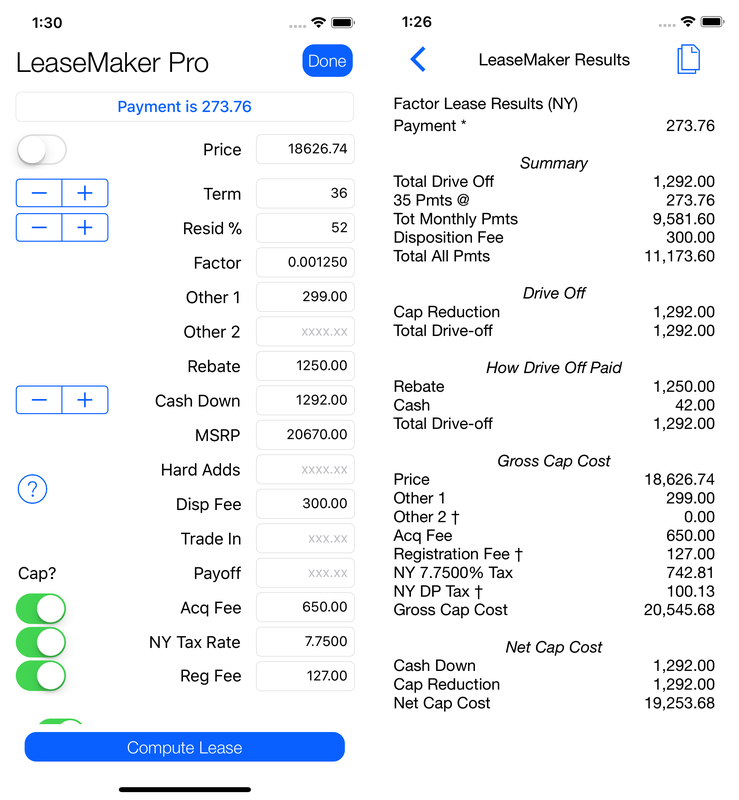 "Ask Lease Type" option allows you to quickly jump from one leasing company to another -- makes it easy to compare payments, etc from one leasing company to another. APRChecker™ Routine computes the APR and verifies the disclosure of loans, computes dealer reserve by three methods. Has minimum dealer reserve and percentage paid feature, and computes interest rate buy-down amounts. This routine is also available as a PC product -- see APRChecker PC. LeaseChecker Routine computes the factor and yield of any lease. The full Regulation M disclosure appears like this. Full details are in the 627B User's Guide. The LeaseMaker Guide to Credit Insurance has detailed information concerning credit life, disability and IUI insurance on installment and balloon loans. This is a PDF file which can be downloaded or read on line. You will need Adobe Acrobat Reader read this file. The LeaseMaker Supplement for Lenders & Lessors has complete information on the APRChecker™ Routine that computes APR's and verifies the disclosure of loans. It also discusses how to do yield and early-termination payoff computations, and also explains the history and derivation of the lease factor. This is a PDF file which can be downloaded or read on line. To change batteries, you should first have the replacement batteries at hand (two CR2032 Lithium batteries are required) and a small screwdriver to remove the two screws on the back of the calculator. Make sure you install the new batteries with the same orientation (plus and minus) as the original batteries (this is also shown on a diagram on the inside of the back cover). The CR2032 battery is available at Radio Shack stores, camera stores or departments, and other places that sell small batteries. It is round, about 0.75 inches (19 mm) in diameter and 0.125 inches (3.175 mm) thick. Click here for detailed instructions on changing the handheld calculator batteries (instructions are also in the User's Guide). You will have to setup the calculator after replacing the batteries. See Setup Codes or 627B User's Guide. If the calculator still does not work, the calculator and/or card are probably defective and need repair. The calculator and card should be Returned for Service. The 627B LeaseMaker is frequently updated to keep pace with the industry, various Federal and state regulations, as well as changes in major leasing companies. This is a list of the most recent changes together with the date they were made and the software Series number. The most recent version is at the top of the list. If your calculator has an earlier version of the software, it should be upgraded. See Instant Upgrade Service or Returning Your Calculator For Service. You will receive the most recent version of the software together with a new User's Guide. Oct 2010 M01.1.24 Add Documentation Fee and ability to tax and cap fee. Jul 2008 M01.1.22 Add Fuel Cost Comparison Routine. Add Help to Setup Key. Jul 2006 M01.1.21 Add New Jersey Supplemental Title Fee calculation. Oct 2005 M01.1.20 Update Minnesota sales tax method on leases. Oct 2005 M01.1.19 Update New Jersey sales tax method on leases. Jan 2004 M01.1.18 Revise New York "Y2" plan for NYBA members - change effective 1 Jan 2004. Oct 2003 M01.1.17 Loan balloon routine defaults to On/Conventional at reset. Revise ND credit insurance formulas. Nov 2002 M01.1.16 Fix problem with balloon-payment factor routine. Sep 2002 M01.1.15 Fix problem with large (over 37,000 per year) excess mileage on leases. Sep 2002 M01.1.14 Add SKIP DRIVE OFF? prompt to suppress Drive-off Disclosure (default is Yes). Change bank-fee legend to "ACQ FEE" for BMW. Update PA & P2 Insurance - max term 72m for gross. Suppress Purchase Option Disclosure for leases if Lease-end Markup is 0. Dec 2001 M01.1.12 Change Luxury Tax rate to 3% and base to $40,000 for 2002. Luxury Tax now defaults to off (must be enabled by user). Balloon (residual) loan option now defaults to off (must be enabled by user). Sep 2001 M01.1.9 Add capability to compute 0% retail and balloon loans. Includes ability to discount (buy-down) 0% loans with dealer-reserve routines. Jul 2001 M01.1.7 Update credit insurance plans in NY (only affects loans in NY with credit insurance), add plan "Y2" for use by NYBA members in New York. Earlier versions should no longer be used in New York for loans with credit insurance..
May 2001 M01.1.6 Update Delaware Lease calculations to allow sales tax on price and payment stream. M01- Minor updates to loan routine. Changed default Luxury Tax Rate to 4%. Oct 2000 M01+ Leases can be calculated to six digits ($999,999.99). Jul 2000 M01: Updated loan routine roll to price with sales tax financed. May 2000 M01 Add non-taxed Rebate feature which excludes sales tax on Rebate used as part of cash downpayment. Affects Massachusetts, Iowa, and can be configured for any state. Also updated Iowa sales tax method. Jan 2000 M00 Millennium Edition with entirely new computational engine to match the recently released LeaseMaker PC product. New tax options allow non-taxed items (such as Extended Warranties) to be capitalized in the lease but not taxed. Downpayment tax can be capitalized in any tax-the-payment state. Changed default Luxury Tax settings to $38,000 base and 5% rate. Oct 1999 L98 APRChecker™ Routine added. This routine computes the APR and verifies the Regulation Z of installment loans, and computes the dealer reserve. You can specify a minimum reserve paid, and a percent reserve paid. Details are in the LeaseMaker APRChecker Routine Guide. Sep 1999 L96 Change Ford Red Carpet Leasing formula per Dealer Bulletin #5677 dated 17 Sep 1999 (formula effective 2 Oct 1999). Change Pennsylvania Credit Life Formula for retail and balloon loans per new PA regulation. Aug 1999 L90+ Change Nations Lease type to BAMER to reflect Bank of America merger. Jul 1999 L90. Change West Virginia credit insurance formula for retail and balloon loans. Feb 1999 L90 Add FIRSTAR and Charter One lease companies. Dec 1998 L80. Change default Luxury Tax to 6%. Jun 1998 L80 Add ability to round or truncate computed retail loan payments. Change Oxford lease type to Nations. Add Tammac Corp lease type. Jan 1998 L66. Change default Luxury Tax to 7%. Change excess mileage and payment calculation for GMAC leases. Sep 1997 L66 Revise lease disclosure to comply with Regulation M.
Bank fee can be capped or put in driveoff. Add Lease Dealer Reserve routine. Add Find Lease Factor and Lease Yield routines. Configuration of the calculator is done through the Setup Routine. After you press the Setup Function Key, you have to enter a code number to access a routine. This is a list of the setup codes and a short description of what they do. 1 Accesses the built-in help routine for Setup Codes (available only on version M01.1.22 and later). 2 Runs the Fuel Cost Comparison Routine. 21 Sets the Fuel Cost Comparison Routine to U.S. or Metric units. 24 Select sales tax state. Push [Enter] to scroll down or [No] to scroll up the list of states, press [Yes] to select the state displayed. For the "Ask State" option, enter a 0. 26 Set Sales Tax options: Tax Bank Fee, Tax Other 2, Tax Rebate & Tax Documentation Fee. 36 Select lease type. Push [Enter] to scroll down or [No] to scroll up the list of lease types, press [Enter] to select type displayed. For the "Ask Lease Type" option, select "ASK" or enter a "0" (formerly a "7"). 37 Set Security Deposit Calculation method. 38 Set Non-Financed Monthly Charge (Local Fee) & Excise Tax options. 40 Set the Lease-end Value Markup option. 48 Install/maintain a credit insurance plan. See Guide to Credit Insurance for details on this code. 50 Select payment frequency on retail loans. Enter a 0 to be asked the frequency on each loan. Frequencies can be 12, 26 or 52. 51 Enable/disable a prepaid charge on retail loans. 52 Select the odd-day calendar. [Yes] selects an Actual calendar, and , [No] a Federal calendar. In both cases, the total number of days to the first payment is entered (on older calculators, only the "odd" or extra days are entered when the Federal calendar is selected). 53 Enable and balloon (residual) loan and select the method. 54 Enable the Short Loan Routine. This option skips all loan prompts except the loan amount. 55 Round/truncate retail loan payment. 99 Displays the single-premium rates used to compute the last loan with credit insurance. 222 Displays the current credit insurance plan for retail loans. 125 Disable/enable New Jersey Supplemental Title Fee calculation. 181 Compute dealer reserve using difference in charges method. 184 Compute dealer reserve using present value method. 185 Compute dealer reserve using prorate method. 199 Start Balloon Loan Payment Factors routine. 726 Install/change "Your Name Here" in the calculator's display. 581 Check loan and compute difference in charges dealer reserve. 584 Check loan and compute present value dealer reserve. 585 Check loan and compute prorate dealer reserve. 681 Same as 581 except activates printer. 684 Same as 584 except activates printer. 685 Same as 585 except activates printer.